I always like to share news and tips about boating products that makes our lives simpler and easier to maintain. Today I want to let you know about some high performance houseboat cleaning and maintenance products that are highly effective and very safe for the environment. As you already know water is a limited highly precious resource, as is keeping our lakes and rivers clean so that we can go houseboating well into the future. That's why I like using safe, green, and eco-friendly products to clean or maintain my houseboat. All of the products developed and manufactured by Mariner’s Choice are completely natural and eco-safe solutions. When released into the environment, they pose absolutely no harm. Yet, all of these products are equal or superior in performance to most products containing harmful compounds or ingredients. As such, all of our products support efforts for environmental compliance to include Clean Marina Programs and other programs underway by associations, activist groups and individuals dedicated to preserving our environment and ecology. Another big benefit to using these products is that Mariners Choice has locations in Canada & the US. They offer free shipping in the US, and they offer very reasonably priced shipping for Canadians. 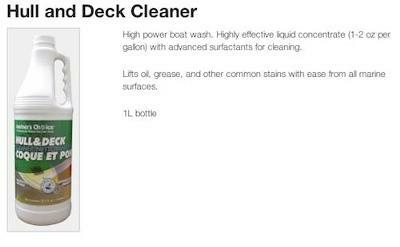 The Hull and Deck Cleaner is a general purpose high power boat wash. Highly effective liquid concentrate (1-2 oz per gallon) with advanced surfactants for cleaning. Lifts oil, grease, and other common stains with ease from all marine surfaces. 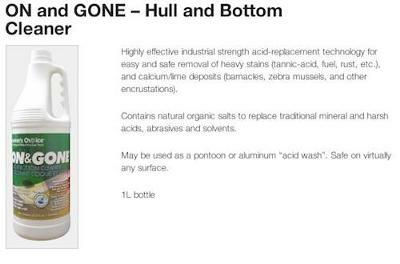 The ON and GONE Bottom Cleaner is a highly effective industrial strength acid-replacement technology for easy and safe removal of heavy stains (tannic-acid, fuel, rust, etc. ), and calcium/lime deposits (barnacles, zebra mussels, and other encrustations). Contains natural organic salts to replace traditional mineral and harsh acids, abrasives and solvents. May be used as a pontoon or aluminum “acid wash”. Safe on virtually any surface. 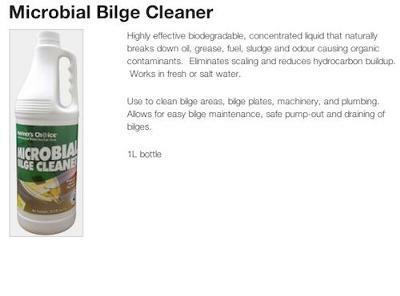 The Microbial Bilge Cleaner is a highly effective biodegradable, concentrated liquid that naturally breaks down oil, grease, fuel, sludge, and odour causing organic contaminants. Eliminates scaling and reduces hydrocarbon buildup. Works in fresh or salt water. Use to clean bilge areas, bilge plates, machinery, and plumbing. 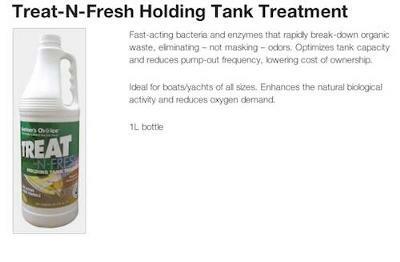 Allows for easy bilge maintenance, safe pump-out, and draining of bilges. The Holding Tank Treatment has fast-acting bacteria and enzymes that rapidly break-down organic waste, eliminating – not masking – odors. Optimizes tank capacity and reduces pump-out frequency, thus lowering cost of ownership. Ideal for houseboats/yachts of all sizes. Enhances the natural biological activity and reduces oxygen demand. If you are using any of these products, do share your results with others here. This way we can all benefit from your experiences, and at the same time help keep our environment clean. My neighbor uses some of the Mariners Choice products and he absolutely raves about them. He told me that the bottom cleaner and the toilet treatment has to be some of the best ones he has ever used. I guess I will now buy my own bottles and stop mooching his supply. I am going to also try the deck cleaner since the cleaner I now use doesn't really do a good job. I will come back and do an update after I receive them.